Here is your step by step guide on how to buy Bitcoin (BTC) on Coinbase. The 2nd step is clicking on the Buy/Sell tab on the top menu. Now you’ll see a list of all the different cryptocurrencies available on Coinbase, Let’s find Bitcoin (BTC) and click on Bitcoin icon. In step 4 you’ll choose which payment method you’ll use to buy Bitcoin. Coinbase offers the following options: Bank transfer, Credit Card or Wire Transfer. Now you’ll enter the dollar amount that you wish to invest in Bitcoin. After you’ve entered the amount you wish to buy in Bitcoin click on the “Buy Bitcoin” button. The final step is to click on the “Confirm Buy” to finalize your order. You Are Now Ready To Buy Bitcoin (BTC) On The Coinbase Exchange. If you liked our step by step guid on “How To Buy Bitcion” please Like us on Facebook. 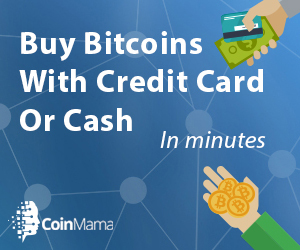 Coinmama is a financial service that makes it fast, safe and fun to buy digital currency, anywhere in the world. Currently you can only buy Bitcoin and Ethereum on Coinmama, they are working on adding additional crypto currencies. Complete the payment and confirm your wallet address. You Are Now Ready To Buy Bitcoin (BTC) On The Coinmama Exchange.